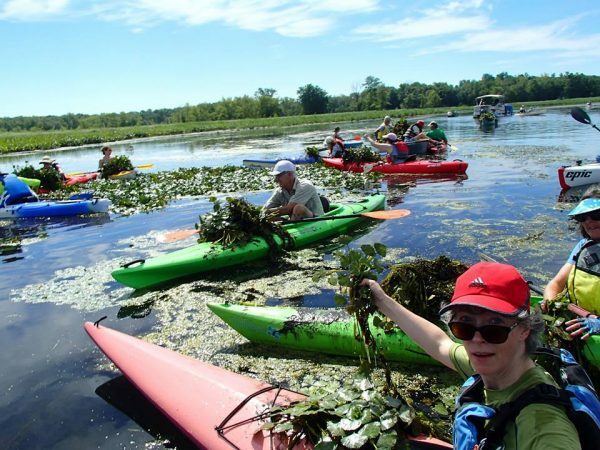 On Sunday, July 8, from 10 a.m. to 12 noon, paddlers will return to the Floating Meadows to remove emerging water chestnut plants. This invasive species endangers our local freshwater marshland. Since plants are still small at this early stage in the season, removing them now saves much labor later in the summer. The Jonah Center is grateful to our partner, the Connecticut River Conservancyn for staffing this work party and covering the event with their insurance policy. All participants will need to sign CRC’s liability waivers and paddle at their own risk. The starting point is the canoe and kayak launch at 181 Johnson Street in Middletown. For information on possible last minute cancellation, check back on this post or call 860-398-3771. New This Year: At the Jonah Center’s request, the City of Middletown has installed a port-a-potty at the boat launch for the entire summer paddling season! The Public Works Department has also improved the facility in other ways you will notice. Thank you Director Russo and Middletown’s Department of Public Works.